Not since Galileo was proved wrong, has the sun been thrust into the centre of such crucial universal debates. With the amount of heat and light energy emitted naturally, it’s the blinding answer we should turn to, to lead the way. It is essential that we learn to harness solar energy effectively in order to sustain our own energy production. Saving the delicate o-zone layer from harmful carbon emissions is an imperative. Solar energy is not only the future of global energy production, it is a major part of the answer to future burdens on the planet, the future of the globe itself. The sun is a natural, free and inexhaustible source of energy. As a vast resource, solar energy has the potential to offer more energy than we could ever use. National Geographic explain that, “Every hour the sun beams onto Earth more than enough energy to satisfy global energy needs for an entire year.” (http://environment.nationalgeographic.com/environment/global-warming/solar-power-profile/). With advanced technology, the efficiency of generating the energy we need is not only achievable but more rewarding. Implementing solar energy technology into building projects is the future. According to SolarEnergyFacts.com, “The worldwide demand for Solar Energy is currently much greater than the amount we have been able to supply.” (http://www.solarenergy-facts.org/) As technology develops, consumer desire to be part of the developing industry is expanding. With the augmenting price of oil, coal and gas, consumers are more inclined towards energy production they can rely on and energy production that is cleaner and healthier for the world now and in the future. 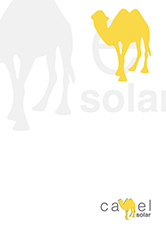 Camel Solar our passionate about the environment, science and efficiency, Camel’s intricate research is constantly developing to bring you optimum products, with maximum efficiency.